Sister Alice’s parents, Arthur and Ethel Lamping were a perfect example of Christian love and values. Arthur was born in Kemptville, Ontario, Canada. At an early age, he worked in his father’s foundry and became an iron molder. As a young man he left Canada to seek adventure in Chicago, Illinois. In the “big city” he found work in his trade at the Elizabeth Street Foundry. He also found his life’s companion, Ethel Tanney. They were married at Saint Pius Church in Chicago on December 27, 1905. Sister M. Geralda (Lamping) and Sister Mary Ann Lamping are now the remaining living members of the 12 children of this marriage. The older siblings in the family grew up and married while Arthur and Ethel continued to nurture their growing family. Alice was born on August 7, 1926. Her mother said she was always independent and did not want to nurse or drink from a bottle, but wanted to drink from a cup long before she was even a year old. Like her sister, Ethel, Alice had a sweet nature and happily took her place in the family. When she was six years old she was enrolled in first grade at Saint Brendan School under the care of the Dominican Sisters. The family moved into Saint Theodore Parish when Alice was in the second grade. Alice entered the Holy Cross Juniorate at Saint Mary’s, which was under the care of Sister Annette. After Alice finished her freshman year, the Juniorate was moved to Morris, Illinois, and Alice also moved to the new site, St. Angela’s Academy. Her senior year of high school was at Visitation High School in Chicago. In 1946 Alice entered the Holy Cross novitiate at Saint Mary’s. Sister Geralda was Alice’s “black veil” and helped her prepare for entrance. 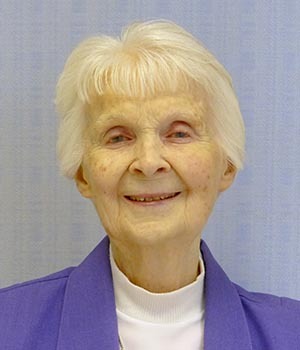 Alice made her initial vows in 1949 and her perpetual vows in 1952. 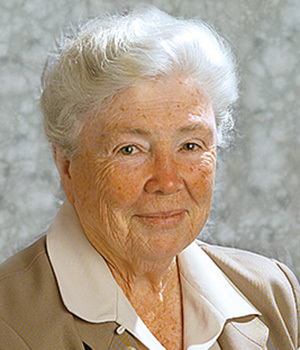 She received her bachelor’s degree from Saint Mary’s College and her master’s degree from the University of Notre Dame. Her first assignments were teaching in various elementary schools in the Midwest. She was known and loved as a strict, but fair teacher who always wanted the best for her students. 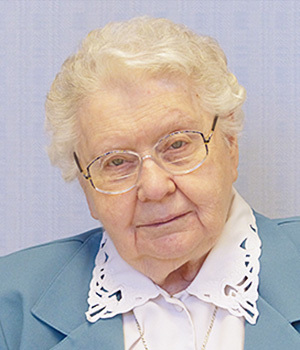 However, successful she was as a teacher, her greatest love came when she began the second phase of ministry, which was serving in pastoral care, visiting the sick and homebound. Another ministry that Sister Alice loved was teaching English as a second language to a group of 30 Cambodian refugees in Danville, Illinois. 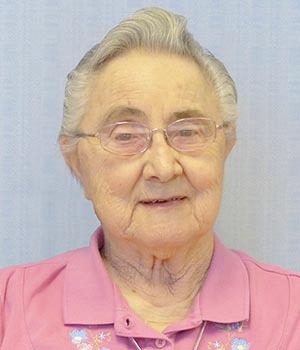 Alice was totally unaware of the love that beamed from her face as she taught these individuals how to survive in this new country, culture and language, but Sister Mary Ann witnessed this on many occasions. This was the hallmark of how Alice did everything, lovingly and carefully. When her mother, Ethel, became ill, Alice moved into an apartment to take care of Ethel during her last years in the same loving manner she did everything. During this time, she taught at the parish of her youth, Saint Theodore in Chicago. 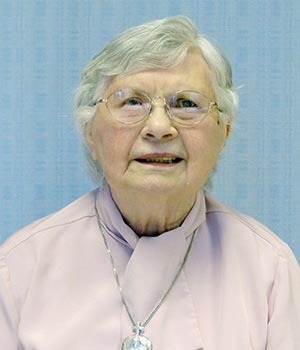 The following reflection is from Sister Kathleen Clausen, OP, niece of Sister Alice. 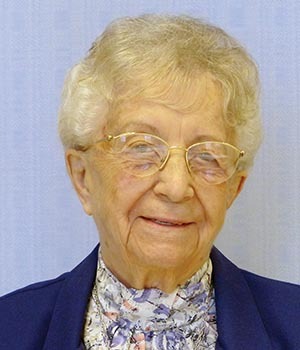 For Sister Alice, God could make all Grace abound in her. She was generous in every good work. Her words resounded like a steady chime that rang forth in persistent perseverance, compassion and empathy. Her abounding love touched all and included everyone. Her heart was wide open and she would do anything for anyone that was in need of her caring. There are many stories to tell within our family where she was the first to act, whether it was being a caregiver for her mother or helping her siblings. She did everything quietly and wanted no fanfare about her deeds. Sister Alice was happy in any space she occupied. She was as straight an arrow and never was afraid to speak out on what she believed and valued as right judgment. Alice had a positive attitude of respect for each person. She would keep conversations positive and always spoke up when attitudes would wander into negative territory. Her ministry in education was fruitful. Being my grandmother’s companion when I was young, I visited her in many of her assignments and witnessed her good works. During her retirement years, Alice made rosaries for the missions and everyone else. It was not a surprise that our Blessed Mother welcomed her home on the feast of her Visitation. Sister Alice and I loved to go fishing. We had great fun in the outdoors on many lakes and boats in California. I have happy and very funny memories of Alice. One such happened when I took my mother (her sister) and Alice out on the Dal Valle Reservoir to catch some trout. I had a motorboat and late in the day we ran out of gas. My mother was terrified and was all worked up about it. Before I knew it, Alice jumped out of the boat and like a flash climbed a large hill to make her way to the dock to get us help. Being in the dry hills of California, I called out to her to watch out for rattlesnakes. I never saw anyone move so fast in my life! She was over that hill in a few minutes. Help finally came and we made it back to the dock safely due to her bravery. 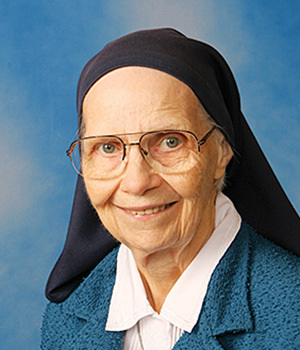 Sister Alice’s life was never anything but “Yes.” I shall miss her and her quiet, caring love and support. God gave us a treasured gift in Alice. Thank you to all sisters, nurses and coworkers for excellent care for Sister Alice and continued care for Sisters Mary Ann and Geralda. We are also grateful for your hospitality. The reality is, we are all just walking each other home. Until we meet again, Alice, may you totally be embraced by the God who loves you. And may you have peace and joy in the home you have always longed for. May you rest in God’s eternal peace. 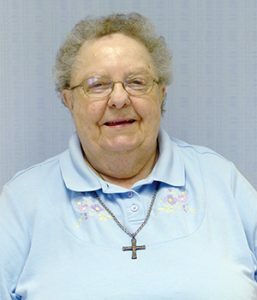 A final word on Sister Alice and her ministry of the rosary. In our planning and sharing session last week, Sister M. John Margaret (Dietzen) gave us the perfect image of Alice when she said that she thought that our Blessed Mother Mary was Alice’s soul mate. What a perfect way to state the close relationship that Alice had with Mary. And how providential that Alice went to God on Mary’s feast of the Visitation. A feast of outreach to others—always the intention and direction of Alice’s life. Over the years Sister Alice has made rosaries for children and adults who live around the world. 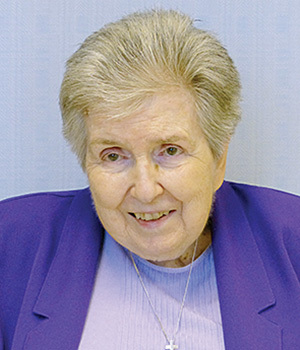 She taught this skill to many Holy Cross Sisters as well as others such as Joan Fortunach, a former employee, who continues to make rosaries with a rosary group in North Liberty, Indiana. Alice not only taught sisters this skill, but also provided materials and tools for this ministry. She found many ways to provide the various types of rosaries which she made. Suffice to say that Alice was ingenious and untiring in her efforts to promote prayer to Our Lady through the rosary. In closing let us rejoice that Sister Alice is now celebrating light and love with her Mother Mary and let us pray: Mary Queen of the Rosary – pray for us.